Christmas is not enough for me, so I'll make yet another giveaway in celebration for New Year's Eve. 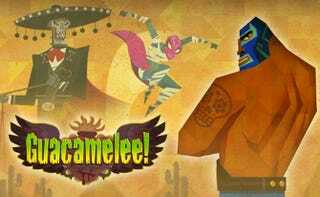 Today's giveaway is none other than Guacamelee! When I first heard about the game and looked at some screenshots, I thought it was a 2d fighting game. Never would I have expected this to be a Metroidvania-type of game – with a Mexican artstyle no less! If you missed the game during the Steam sale before (It was featured in a Flash Sale twice), now's your chance to get it! I'm giving away both the game itself and the soundtrack. In order to participate in the giveaway, go here. In case you're new to Steamgifts: The website's system automatically determines a winner among the participants automatically. I'll then send the games via e-mail or directly over Steam to the winner. The giveaway runs until December 31th. Good luck to all participants, and a Happy New Year to all of you!